During my walk today I noticed how brown things are starting to look in London. We haven’t had any rain recently and the grass, trees, and shrubs are starting to show it. Here’s a photo I took last year during my visit to Concord, Massachusetts. It was so green! This entry was posted in Travel Photos and tagged 50 Year Project, Concord, Dry Weather, Life, London, Massachusetts, No Rain, Photography, Travel, Travel Blog, Travel Journal. Bookmark the permalink. I hope so. And it didn’t get too hot. Beautiful, I’m missing green too. I bet it’s getting brown in your area with all of the heat. I really like that photo – it looks like the setting for a good novel! A delightful Gothic story I think. I hope to make it there this fall! Will be in Boston in late October; it might not be so green for me. You never know. It rains a lot in Boston. Are you going to check out the Halloween festivities in Salem. I never got around to that. Huh, thanks for the tip. I don’t think I had thought about such a thing. Will keep my eyes out. It’s been pouring here and everything is green, green, green. It was like that earlier here, but it dries out so quickly. Enjoy the green! Don’t worry rain is heading up from here in the west! And it has arrived. Thank you! Oh no, autumn is round the corner. I’m excited. I love the changing of seasons. Growing up in California, where the seasons don’t really change, made me feel like I was missing out. We had lots of rain in Massachusetts that spring. I love nature and its powers. Hope you get some rain soon. Nice photo! It would be cool to come across something like that nestled amongst the trees. It has rained a little over the past two days. Looks like more might arrive today. That’s a lovely photo. If you were to come north of the border you’d find lushness everywhere, we’ve had a lot of rain in Scotland this summer and I must say it does make everything look fresh and burgeoning. A friend of ours is moving there this winter so we’ll be sure to visit! That is so so beautiful. I imagine it would be a little eerie at night, but during the day it looks like a fairy house! I would love to see all the fairies, only if they were friendly of course. Hard to find brown in the British nature, isn’t it? 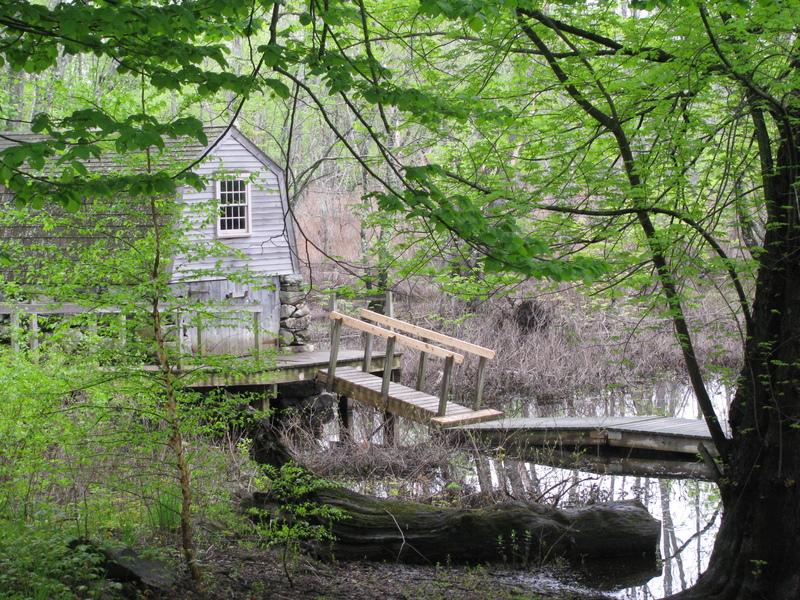 Lovely shot of Massachusetts, it looks so calm and tranquil. This part is perfect…away from all of the cities and full of history. Thanks!